Volume II, is where Taibi continues his story of the D&H and its connection to all of the towns served between the 'City of the Hills' (Oneonta) and the 'Parlor City' (Binghamton). 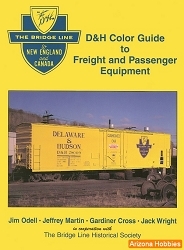 This book contains more than 600 first-generation color, sepia, and black & white illustrations - from vintage stereo-views and post cards to Color photographs of current owner Canadian Pacific Rail sharing the steel ribbons with Norfolk Southern. Vintage D&H steam and early diesels to the most modern motive power - AC4400CW, SD60 SD90, ES44AC, C40-9W, and ES40DC - are captured at various locations over the line. Union Pacific and BNSF run-through power makes numerous appearances. An extensive introduction reviews the first book. Then Volume II starts its own story with an all-new section on Oneonta. From there the journey continues down the Susquehanna watershed through Otego, Wells Bridge, Unadilla, Sidney, Bainbridge, Afton, Nineveh, Harpursville, Belden, Tunnel, Sanitaria Springs, and Port Crane - concluding at the 'Parlor City', Binghamton. Depot Square Publishing, hardcover with dust jacket, 341 pages, 8.75 x 11.5 in., 619 illustrations (over 300 in full color), maps, blueprints, bibliography, and a complete index. Oblong hardcover with dust jacket format with a protective gloss film lamination. Printed at 175-line screen on 80 lb. Sterling Gloss Text paper.